DKSH publishes the first report on its economic, environmental and social activities based on the internationally recognized Global Reporting Initiative guidelines (GRI). As a Swiss company with more than 150 years of tradition in Asia, good corporate citizenship is an integral part of DKSH's business model. Bangkok, Thailand, October 18, 2018 – DKSH, the leading Market Expansion Services provider with a focus on Asia, published its first report based on the Global Reporting Initiative guidelines (GRI). For the first time, clients, customers, investors, employees and the public gain insights into the economic, social and environmental activities of DKSH. The report has been established according to the GRI option “core”. On more than 50 pages, the report contains information about DKSH's economic, environmental and social activities, their resulting impact and the respective management approaches. In total, twelve material topics have been identified; while the report focuses on DKSH's core activities, such as sales, marketing and distribution. DKSH's vision for sustainability is to support economic and social progress in the Asian communities it operates in. This includes fulfilling the fundamental purpose of bringing key consumer goods, healthcare, performance materials or technological products to markets while operating with integrity, trust and reliability. In the presence of Right To Play Thailand, the GRI Report was presented to the public in Bangkok. DKSH has been a long-standing partner of Right To Play, an organization that focuses on education and empowering disadvantaged children through the power of play. 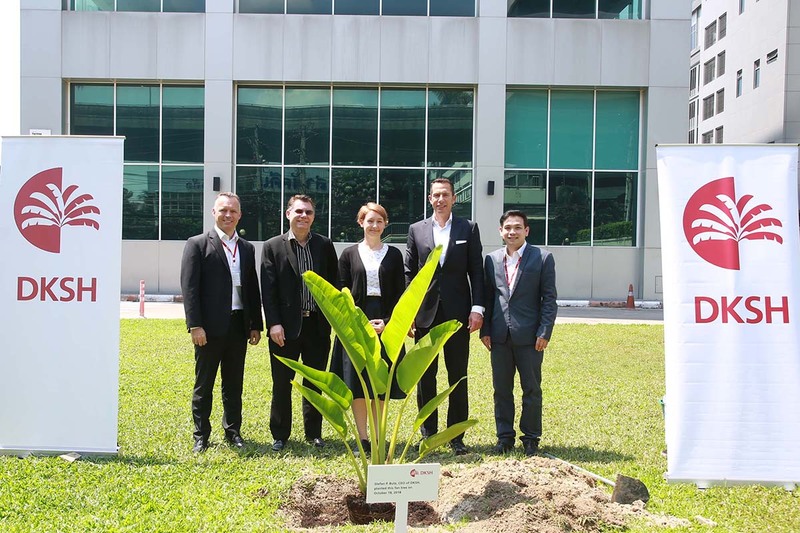 Picture caption: Presentation of DKSH's GRI Report on October 18, 2018 in Bangkok (from left to right): Carl Johan Söderstjerna, Vice President, Central Services, DKSH Thailand; Douglas Humphrey, Head Country Management, DKSH Thailand; Niamh De Loughry, Country Director, Right To Play Thailand Foundation; Stefan P. Butz, CEO, DKSH Holding; Jaturong Jerdsakulboon, Vice President, Legal & Compliance, DKSH Thailand.